You’ve seen how we can package our customizations using features and solutions. By using these methods, we can activate and deactivate particular features to achieve our desired level of functionality. This process works well if we’re adding functionality to an existing site, but what happens if we want to create a new site that uses functionality that’s encapsulated in a number of features? As we did in an earlier example, we could start out with a blank site and enable the appropriate features. However, SharePoint provides a better way to achieve this result. We can create a custom site definition. To understand how a custom site definition fits into the overall picture, select New Site from the Site Actions menu on any SharePoint site. Each of the items listed in the Create dialog is an example of a site definition. Basically, a site definition is a template that can be used to create new sites. By creating a custom site definition, we can specify how a new site is provisioned, including which features should be activated and which lists and libraries should be created by default. Regarding site definitions versus site templates, from SharePoint Designer, we can save a site as a site template. When using this function, we’re actually creating a WSP package that contains a list of customizations to whatever site definition the site was created from. This type of site template can then be applied to other sites that are derived from the same site definition. This functionality differs from that of creating a custom site definition because site definitions can be used only when creating new sites. Confusingly, site definitions as stored on each front-end server in the %SPROOT%TEMPLATE\SiteTemplates folder. In a similar manner to features, each site definition has its own folder. The site definition configuration is stored in a file named onet.xml within the XML folder. Site definitions have been part of SharePoint since day 1, whereas the feature framework was introduced in Windows SharePoint Services 3.0 to provide a higher degree of flexibility. As a result of this, site definitions come with some serious baggage and can be pretty complex. The recommended approach with SharePoint 2010 is to factor as much configuration into features as possible. This helps to keep site definition files maintainable while still allowing a high degree of flexibility. When creating site definitions, bear in mind that future service packs for SharePoint may overwrite out-of-the-box files. Always create a separate folder for any customized site definitions. As you’ll see when using Visual Studio, this approach is adopted automatically. Let’s look at how we can create a new site definition using Visual Studio. Choose File | Add | New Project. onet.xml Contains the site definition markup. Each onet.xml file can contain more than one configuration, where a configuration is for all intents and purposes a site definition. webtemp-Example19DemoSite.xml The SharePoint platform builds a list of available templates by examining the %SPRoot%Template\1033\xml\ folder for XML files with names beginning with webtemp. These files act as a table of contents for the site definitions that are stored in each onet.xml file. default.aspx As you’ll see when we look at the onet.xml file, the default.aspx file is deployed to the root of a new site that’s created using our custom site definition. Without this file, there would be no home page for the site. The most important element in the onet.xml file is the Configuration element. Each file can contain more than one Configuration element, and each element must have a unique ID. The Configuration element effectively defines a distinct site definition. Our file has a single site definition named Example19DemoSite, which refers to a module named DefaultBlank. Our onet.xml file also contains a Modules section that is outside the Configurations section. These modules can be shared between all configurations in the file. Modules are used to provision files to a SharePoint site and can also be added as feature elements by adding a Module item to a project. In our sample, the default.aspx file is being provisioned to the root of the new site. 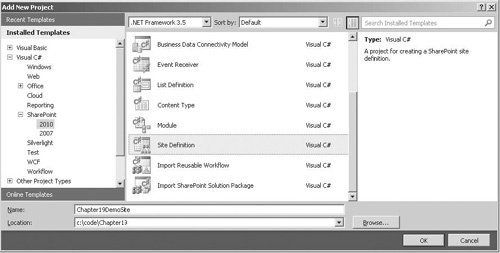 As mentioned, with SharePoint 2010, the recommended approach to creating site definitions is to use features as much as possible. We can specify which features are automatically activated when a site is created by adding Feature nodes to the SiteFeatures and WebFeatures elements. These elements represent features that should be activated at the Site collection level and features that should be activated at the site level. Our site definition will now automatically activate our two features when a new site is created. Deploy the solution by choosing Build | Deploy in Visual Studio.